With a desire to fill the gaps in community services, Emma Hopkins-Curry is determined to ensure other people have the support that she did not. As a widow in her 30s, Emma discovered that there was very little support for young widows, so in 2013, she started a support group for bereaved spouses under 50 called the WWSG (Widow and Widower Support Group). “The group started off quite small but quickly grew and we now have over 150 members and meet monthly. We have added Geelong and Canberra sectors, and are working on a Bendigo one to reach the rural community better,” said Emma. 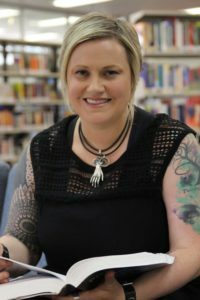 Emma initially completed the Certificate IV and then a Diploma of Community Services at local community houses, and then moved to Box Hill Institute to enrol in the degree course in 2015. “I never thought I would ever consider a Bachelor degree, yet here I am at the end of my second year,” she said.